Chicken is what I often return to as my protein and meat of choice. Why? It is easily available, for one. Then, it doesn’t require as much lead or prep time to get a meal ready. And, I like it! So, every year when thanksgiving rolls around my thoughts turn to the smaller of the two birds. Truth be told, turkey meat is not as juicy or soft as chicken. The few times that I’ve had thanksgiving turkey (prepared by others) I haven’t really enjoyed it. Nothing against the cooks or the bird. I really do enjoy using sliced turkey meat for sandwiches. But by itself, even with gravy and cranberry sauce, it doesn’t pass muster. 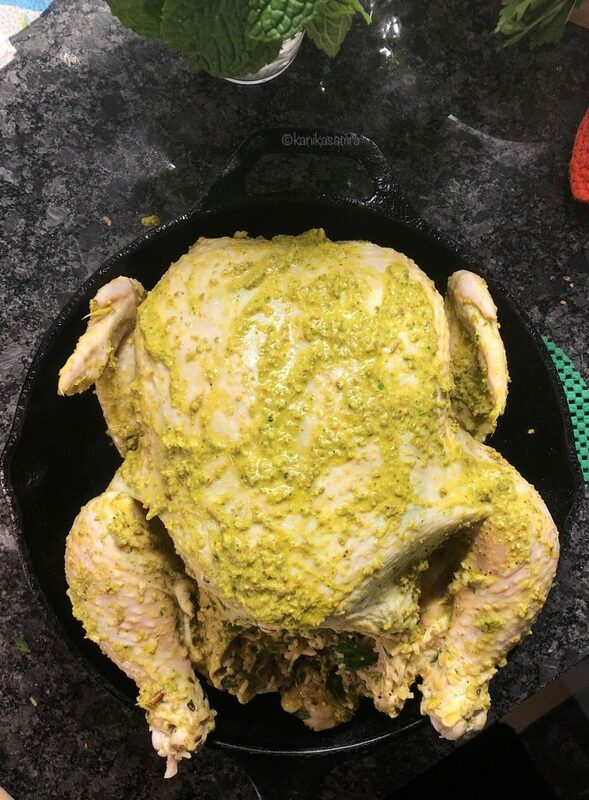 So this year, I finally bit the bullet and refined my chicken roasting skills. 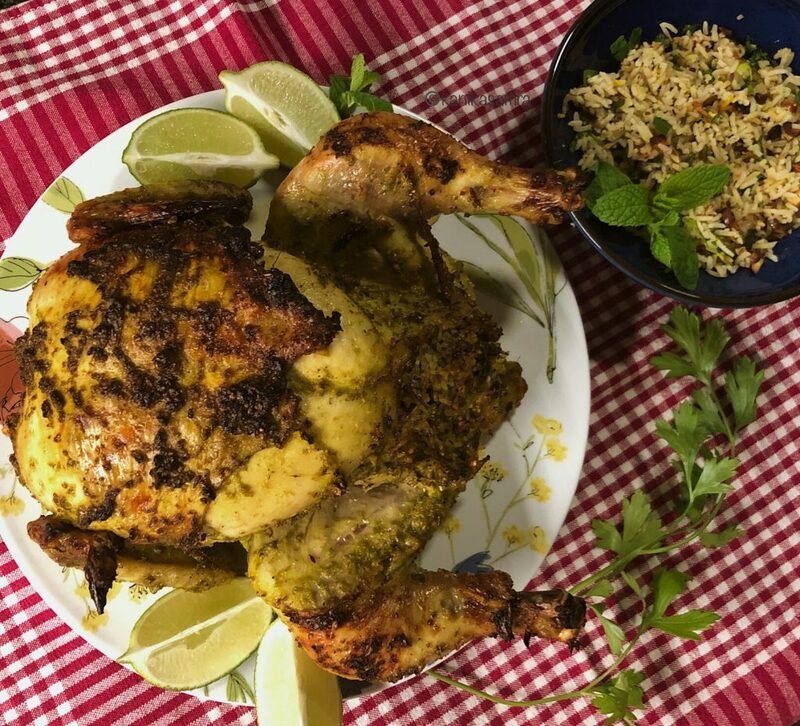 The end result is this recipe for a Roast Chicken with a Saffron Pilaf Stuffing. 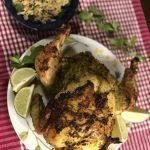 If you are unsure about roasting a turkey or if you are just craving well cooked chicken – try this recipe. Until recently, I hadn’t brined any meat. I had marinated plenty. Even now, after doing the whole thing and creating a recipe for my brine, I am not entirely sure this is something I will do any time soon. So, beware. If you have plenty of time at hand, then brining and going the whole nine yards might be an interesting experience, just for the sake of it. But, is it worth the while? Read an obituary of wet brining here by Kim Severson. According to her and many others that she spoke to or quotes, the era of wet brining is over because dry brine works just as well or better. She quotes Meathead Goldwyn, a barbecue master, who puts it bluntly that turkey is dry, period. To eat it well, cook it slow and “make some great jus”, i.e. juice i.e. gravy. That’s what brought me here in the first place – the dry turkey. My alternative is a roast chicken. This might not be your alternative, but try to use the marinade and pilaf for another meal. 20 minutes to make the brine & 12 to 24 hours for soaking the chicken in it. Before starting this experiment (which succeeded, so read on!) I read quite a lot about brining and arrived at my formulation using ideas from a variety of sources. To make a liquid brine most sources from Bon Appetit to New York Times Cooking, write that two things are important – boiling the brine to mix salt and sugar and then cooling it to room temperature before soaking the chicken. 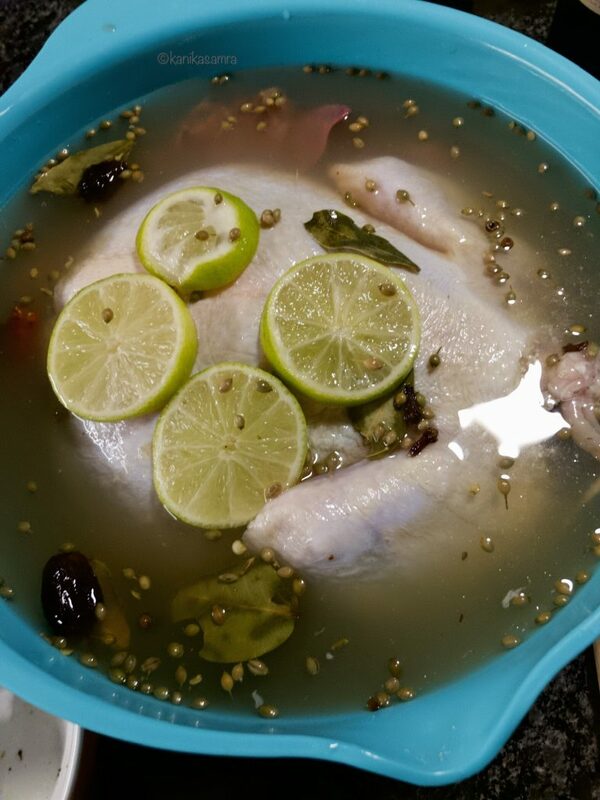 Ideally, prepare the brine in a large pot that will hold the bird. If not, transfer to one where you can brine a whole chicken overnight in the fridge. I covered the bowl with foil and left it in the fridge for 24 hours. 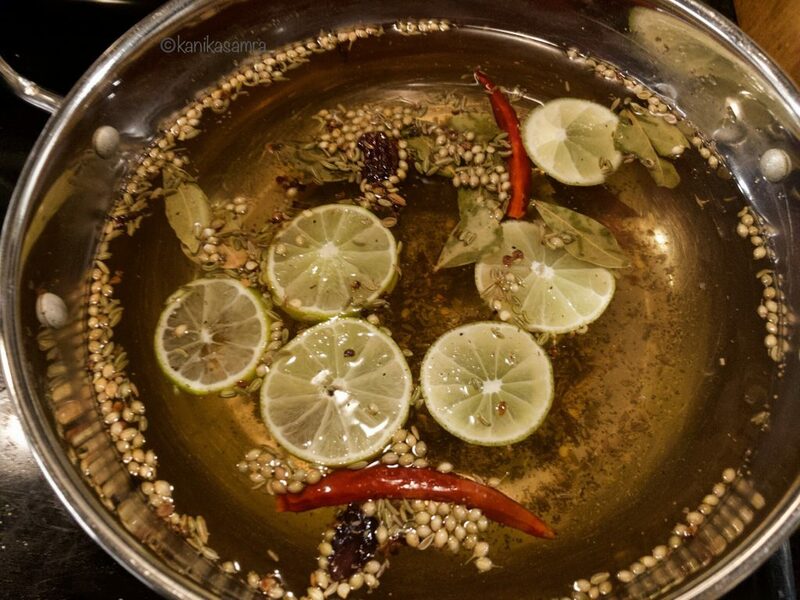 To make the brine, add water to a pot, add all spices and salt and sugar; then bring to a boil. Cool before submerging the bird in it. As for the salt measure – use 1 tsp for every 3 1/2 pounds of chicken. My chicken was 5 1/2 pounds in weight so I added a little more than 2 tsps of salt. It is often recommended to use coarse salt like sea salt or kosher salt for their clear saltiness instead of table salt that has iodine. But the difference in flavour isn’t much, so use what you have. Grind or replace spices with powdered forms, such as – coriander seeds, cumin seeds, fennel seeds, cinnamon and cloves. Skip – bay leaves, whole black cardamom and lime. 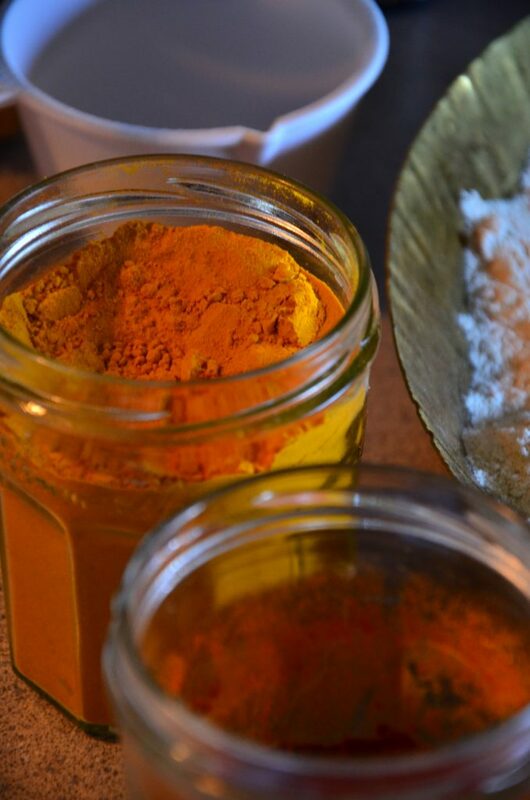 Mix together – salt, sugar and all ground spices. Apply generous amounts and rub well on the chicken, covering every bit of it as well as the cavity. Keep in the fridge, uncovered for anywhere from 1 hour to 24 hours, depending on the time available. Then proceed with the rest of the process – stuffing and roasting. Step 2: The next day, cook Pilaf for stuffing. 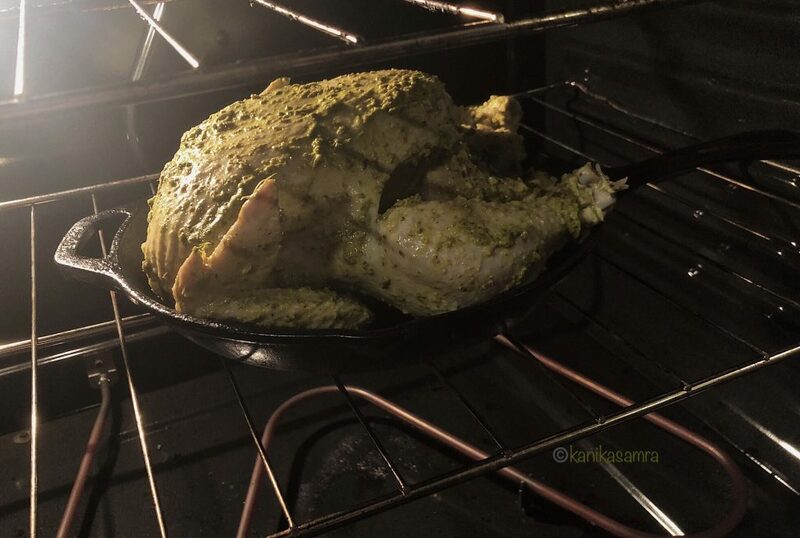 Roasting a chicken with stuffing is not necessary. But this being an alternative to a thanksgiving turkey, I decided to go ahead and make a stuffing anyway, albeit with a difference. If you’ve been around for a bit you’ve likely seen the write up about food in Santa Fe. 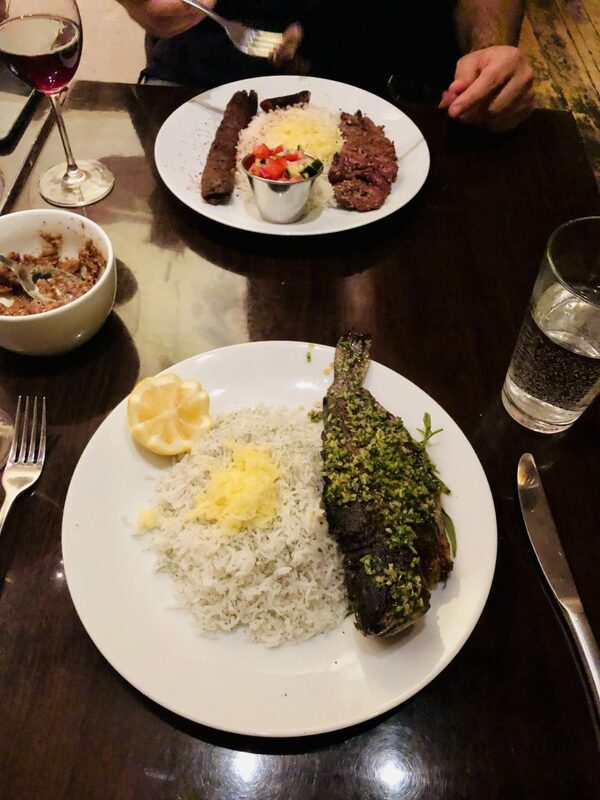 Inspired by my experience of eating a trout stuffed with lots of chopped nuts – walnuts, pistachios and more – at the Milad Bitro in Santa Fe, I decided to mimic the same with the pilaf. I later learnt that this version of stuffed chicken with rice is in fact a Persian dish called Morgh e Shekam Por. There are a lot of recipes for it on the web. I used ingredients available to me and worked with them. So, you should be able to adapt along the way too. 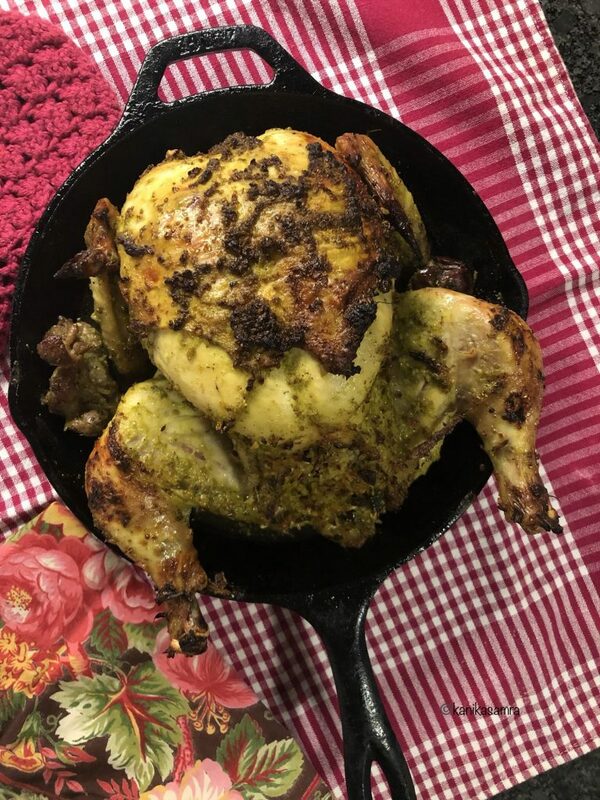 This roast chicken isn’t an attempt to make a Morgh e Shekam Por, it is instead a roast chicken with Indian flavours and Persian inspiration for an all American festival. That’s glocal for you! 10 minutes to prepare ingredients and 25-30 minutes to cook. To start, measure the rice and then wash until water runs clear. Let them soak in about a cup of water while you prepare other ingredients. Slice onion and finely chop the tomato. Then, heat a large, deep that you will use to cook the rice. Once heated, add oil to it and turn the heat to medium. Add cumin seeds, cloves, bay leaves and saute until the seeds are spluttering. Next, add onion and cook on medium heat until caramelized. To this add tomato and stir. Add salt, and mix well. Tip in the rice and add another cup of water. Finally, put saffron strands on the water’s surface, lower heat to medium low, cover and cook until rice is done. 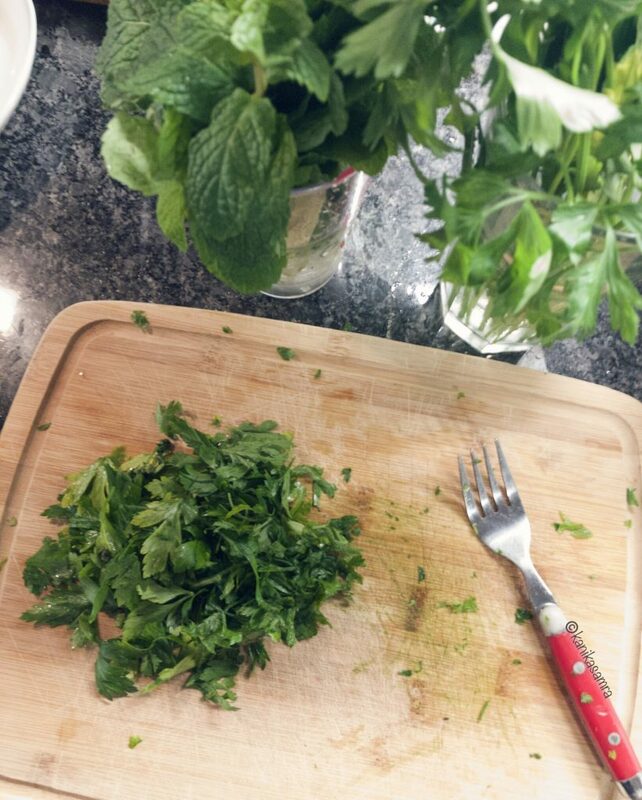 While the rice cook, clean and chop parsley and mint. 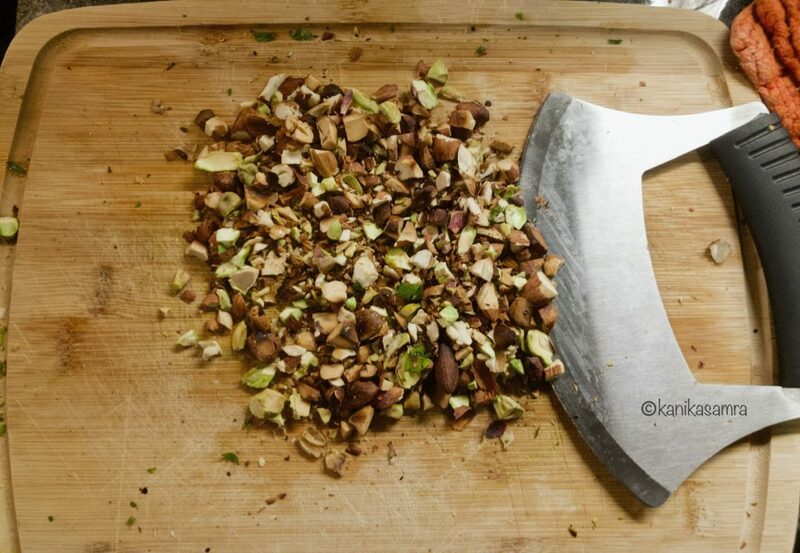 As well as finely chop the nuts and keep them ready. Once the rice is done, remove from heat and let them cool. I transferred the pilaf to an open mouthed bowl to help the cooling process. When the rice are almost at room temperature, add herbs, nuts, squeeze the juice of half a lime on top and mix well. This quantity of rice is much more than the amount needed as stuffing. Keep aside about 1 1/2 cup for stuffing the chicken. Serve the rest along with the chicken during the meal. 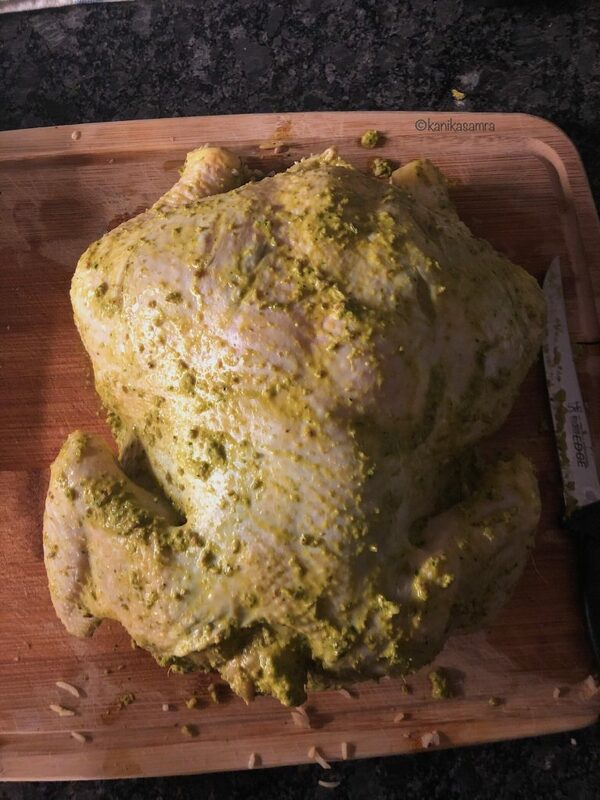 Reading this the obvious question should be – why add more masalas when the bird has already been brined for 24 hours? For the simple reason that brine is washed off before roasting and I like my chicken with more flavour than just salt. I had a premonition, even before I read the obituary for wet brine, that brining wouldn’t help my chicken retain flavour. After all my effort, it was back to the good old marinade for real flavour. The chutney like marinade, call it what you like, is a quick and simple blend of ingredients that will reinforce flavours of the birne – if retained – and complement the pilaf. 10 minutes of cleaning and grinding in a processor. To make the marinade put everything listed above in a food processor and grind into a thick, creamy paste. That’s it. This marinade is like a chutney that can be used as an accompaniment. There will be some leftover after marinating the chicken. Use it up! Chicken rubbed with a fresh marinade before roasting. Step 4: Roast it, already! Now for the main event. All this prep comes down to the magic of the oven and time. Time to preheat the oven and 1 hour to 1 1/2 hours for roasting. An ovenproof skillet such as a cast iron skillet. First, preheat the oven to 450 F or 230 C.
I used a cast iron skillet. If you are using one too, let it preheat in the oven. In the meantime, remove chicken from the brine and pat it dry with kitchen towels (paper) or with a paper napkin. If you end up using a cloth, please wash it immediately in hot water with plenty of soap. Next, prepare chicken for the oven. To do so begin by applying generous quantities of the marinade on all sides of the chicken and inside the cavity. Then, take the pilaf that had been kept aside – 1 cup or more – and stuff it in the chicken. Once the oven is ready, take out the skillet and carefully place the chicken in it with the breast facing up. If you have cooking twine or color-free thread, tie the legs together. If not roast as is; that’s what I did. Return the skillet to the middle rack in your oven and roast at 450 F for 40 – 50 minutes. At the 40 minute mark start basting chicken with juices collecting in the pan. Do this a couple of times until the 50 minute mark. At this point check the chicken by piercing with a knife. If the juice runs clear, i.e. there is no red or pink color, the chicken is cooked. If not, lower the temperature to 400 F and cook for another 15-20 minutes. Baste in between with pan juices. Once done, remove chicken (still in the skillet) from the oven and let it stand undisturbed for another 5-10 minutes. The cooking process continues while the pan is still hot. Serve from the skillet or place it in a plate and carve everyone’s favourite pieces. Serve pilaf, maybe some whipped yogurt, a chutney and a salad with it. No worries! 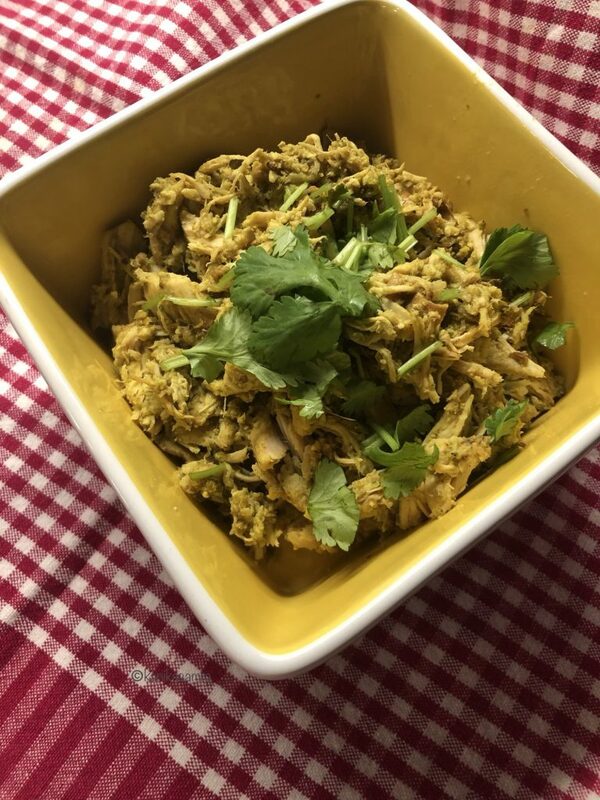 Shred the remaining meat and then cook it with any leftover marinade and, you’ve got shredded chicken ready to use as a sandwich filling or to eat with a salad or even with chapati and dal. Hope you will try ideas here – for the roast chicken, pilaf and the chutney like marinade. Do tell us if you do, we’d love to hear your thoughts and improve upon these recipes. Roast chicken is an easy meal to make - but one that needs love and time. Make this version with a delicate rice pilaf to serve both as a side and stuffing. To make the brine, add water to a pot, add all spices and salt and sugar; then bring to a boil. Cool before submerging the bird in it. As for the salt measure – use 1 tsp for every 3 1/2 pounds of chicken. Transfer chicken to the brine, cover and refrigerate until ready to roast. Apply generous amounts and rub well on the chicken, covering every bit of it as well as the cavity. Keep in the fridge, uncovered fro anywhere from 1 hour to 24 hours, depending on the time available. Measure the rice and then wash until water runs clear. Let them soak in about a cup of water while you prepare rest of the ingredients. Slice onion and finely chop the tomato. Heat a large, deep that you will use to cook the rice. Add oil to it and turn the heat to medium. Add cumin seeds, cloves, bay leaves and saute until the seeds are spluttering. Next, add onion and cook on medium heat until caramelized. To this add tomato and stir in. Tip in the rice and add another cup of water. Finally, put in saffron strands, lower heat to medium low, cover and cook until rice is done. Clean and chop parsley and mint and finely chop them and the nuts. 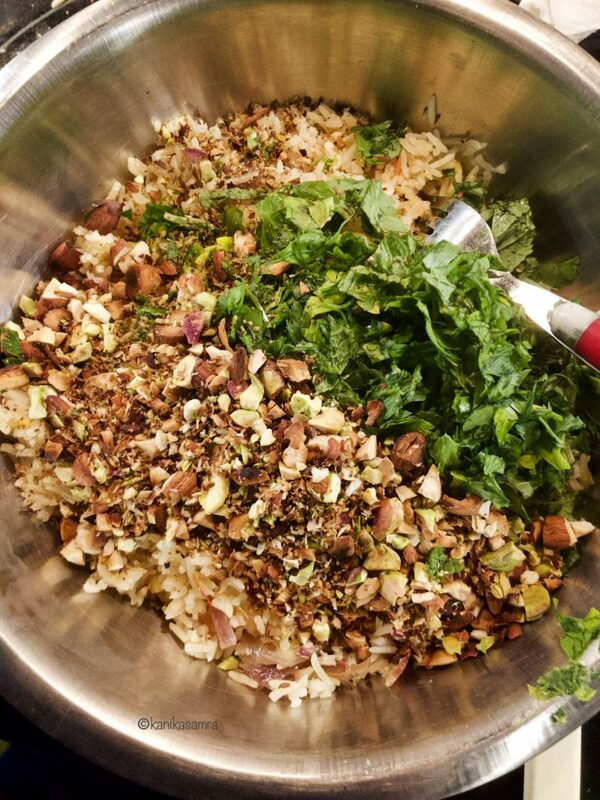 Once the rice are cooked, cool and then mix in herbs and nuts. Keep aside 1 cup for stuffing the chicken. Serve rest along with the roast chicken. 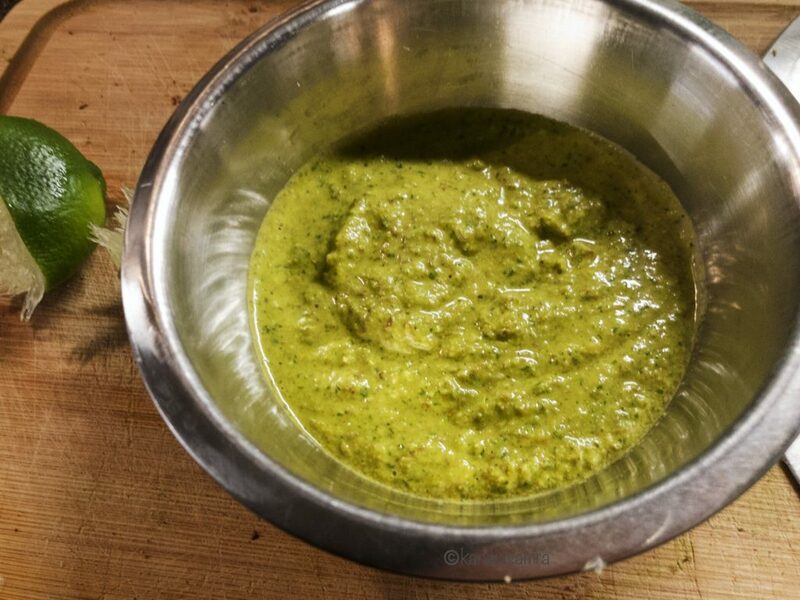 To make the marinade put everything listed in a food processor and grind into a thick, creamy paste. You'll need either a roasting pan with a rack or an ovenproof skillet such as a cast iron skillet. Remove chicken from the brine and pat it dry with kitchen towels. Next, prepare the chicken by applying generous quantities of the marinade on all sides and inside the cavity. Then stuff the pilaf - about 1 cup of it - in the chicken. Once the oven is ready, take out the skillet and carefully place the chicken in it with the breast facing up. Return the skillet to the middle rack in your oven and roast at 450 F for 40 – 50 minutes. At the 40 minute mark start basting chicken with juices collecting in the pan. Check the chicken by piercing with a knife. If the juice runs clear, the chicken is cooked. If not, lower the temperature to 400 F and cook for another 15-20 minutes. Wait for 10 minutes before carving cooked chicken. Along with this serve pilaf, maybe some whipped yogurt, a chutney and a salad. It is often recommended to use coarser salt like sea salt or kosher salt for their clear saltiness instead of table salt that has iodine. But the difference in flavour isn’t much, so use what you have. The marinade is like a chutney that can be used as an accompaniment. If you are using a cast iron skillet or oven proof skilltet, let it preheat in the oven.